Wake up lights are not new; they have been around for years in different capacities. But, these alarms are becoming more popular as time goes on. As far as alarms go, wake up lights are some of the most effective for people. They use your eyes’ natural response to light by simulating a sunrise when you want to wake up. This gradually wakes you up and helps you stay in a better state of mind, rather than waking you up abruptly and rudely. Which wake up lights are good and which ones aren’t so good? I want to take a closer look at one of the well-known wake up lights by Philips. 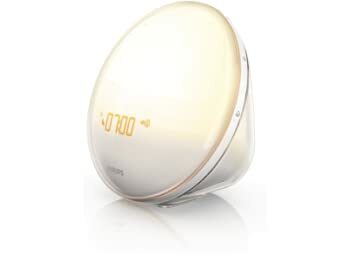 I’m going to tell you about the features, the pros & cons, who it’s best for, what you’ll get from it, and what other customers have thought about this wake up light. Who Should Buy This Wake Up Light? If you’re looking for a good wake up light, this could be the one you want. It’s great for people who are light to heavy sleepers, but not very heavy sleepers. It can be a bad fit for you if you’re sleeping with your partner and they are a lighter sleeper than you, unless they are willing to wear a mask. Wake up lights like this one that can be very bright are perfect for those locations that get very foggy and cloudy. Using this Philips HF3520, you can get a dose of synthetic sunshine to wake you up in a good mood, even if the rest of the day will be cloudy and dreary. Lastly, this wake up light is great for anyone that doesn’t like to worry about their alarm. Once you set the two alarms, you have very little to do with the machine each day. Even the snooze button is just tapping the light itself! It doesn’t get much easier than this wake up light. If you want a few extra minutes of rest in the morning, all you have to do is tap the front light. This activates the snooze for 9 minutes. While snoozing, the alarm sound turns off and the light stays on. When you set the alarm, the light will turn on between 20 – 40 minutes before the time you have set. Once your set alarm time arrives, a sound will play to wake you up. This can be your favorite FM radio station or 1 of the 5 natural wake up sounds. The included sunrise and sunset simulations use realistic colors and make your room look as if the sun really is rising or set there. You can adjust the length of both the sunrise and sunset to match your preference. The clock display on your HF3520 wake up light automatically dims as your room gets darker in the evening. This way the clock doesn’t cast a bright enough light to disturb you. You can set 2 different alarms for this clock and cycle between them as you need to. Many people like to set a weekday and weekend alarm instead of changing back and forth every time. Change the brightness on the light so that you wake up to the right brightness level for you needs. If you have light sensitivity issues with your eyes, this feature allows you to lower the brightness to a tolerable level. At full brightness, this wake up light has 300 lux intensity. You can turn the light on at any time to use as a lamp. It will stay on constantly until you turn it off. It also acts as a timed lamp when it reaches full brightness in the morning, because it will stay on for 2 hours from that point and turn itself off afterwards. Most of the reviews on this wake up light have been excellent. There are some slight annoyances people mention, even when they like the wake up alarm. Not everyone liked it, but I would say that a lot more people were happy with their purchase than those who are unhappy. Negative comments about the Philips HF3520 wake up light alarm included that it’s a bit larger than expected, the new LED bulb is not replaceable, and that the buttons are more complicated than they should be. Positive comments talked about how nice the colored sunrises and sunsets are, the peaceful (but effective!) wake ups, and the adjustments that can be made. Let’s talk about the negatives first. A few people mentioned that it was closer to the size of a dinner plate when they expected it to be smaller, based on the pictures. This is only really an issue if you have a tight space to place it in your room. It’s about 10 inches tall and is fairly round, so just plan for that space and you’ll be fine. This can actually replace your bedside lamp, so you might be able to make room by removing a lamp from your room. As far as the LED bulb not being replaceable, this should never be an issue. These bulbs have a 20+ year lifespan, so there’s little chance you will ever experience a burn-out bulb. LEDs are more energy efficient and allow the colors to change to make the beautiful sunrise and sunsets on this device. Unfortunately, it’s true that the buttons are a bit complicated. There is an instruction manual that you can use to set up your alarms, although it’s not very clear about how to do everything. However, once you get your settings how you want them it’s unlikely that you’ll have to adjust it again so this is only an inconvenience the first time you use it. Now, how about the positive reviews? The colored sunrises and sunsets were praised for being beautiful and realistic. Sunset mode is said to be very relaxing and it can really help you sleep at night by dimming slowly to make you feel tired more quickly. Because of the realistic colors, it might actually work better than the previous models. This is a very peaceful alarm clock to wake up to. Many people like the birds chirping sound as their alarm tone. Actually, a lot of reviewers mentioned that they wake up even before the alarm tones most mornings. This is a good thing because they wake up feeling rested and happy, not dreading the morning! The last thing that a lot of people like is the fact that you can adjust the brightness, the timing, and the sounds so much. It’s great for a wide range of people, as not everyone will like a super bright light in their rooms and many people like to adjust the wake up alarm tone. You can get some versatile options with this wake up light, so you can make it the perfect alarm for yourself, no matter what you like. As you might be able to tell now, this is a pretty good wake up light. None of the disadvantages are deal-breakers for most people. You might not want this particular wake up light if your area is prone to a lot of short power outages, because it does not have a battery backup. Otherwise, it’s a pretty convenient device that is likely to help you wake up happily in the morning. Check the current price of the Philips HF3520 wake up light alarm now and see about changing your whole morning routine!